Wandering Tattler: Medium sandpiper, solid gray upperparts and heavily black-and-white barred underparts. Face is finely streaked and eye line is dark. Long, black bill. White eye ring. Dull yellow legs and feet. Eats insects, larvae, worms and mollusks. Quick, direct flight with rapid wing beats. Wandering Tattler: Breeds in mountainous areas of south-central Alaska and northwestern British Columbia. Spends winters on Pacific coast from central California southward. Found on rugged, rocky coastlines, jetties, and breakwaters, but during migration may be found on sandy beaches and coastal estuaries. Although their feet are not webbed, they are decent swimmers and can swim as chicks. In Greek, the genus name, Heteroscelus, means "different leg." It refers to the small scaling on their feet, which differentiates these tattlers from other sandpipers. It is believed that hunters named Wandering Tattlers for their loud and scolding calls, which warn other birds of approaching danger. A group of tattlers are collectively known as a "whisper" of tattlers. 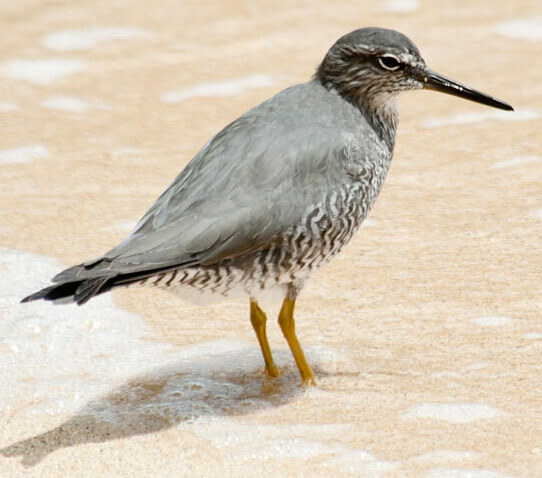 The Wandering Tattler has a large range, estimated globally at 100,000 to 1,000,000 square kilometers. Native to the Americas and nearby island nations and vagrant to Asia, this bird prefers subtropical inland wetland and neritic or intertidal marine ecosystems. 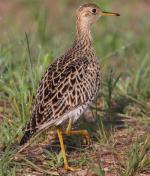 The global population of this bird is estimated at 10,000 to 25,000 individuals and does not show signs of decline that would necessitate inclusion on the IUCN Red List. For this reason, the current evaluation status of the Wandering Tattler is Least Concern.